I've been interested in these for a while and I picked one up today. It's in excellent condition with all original attachments, foot control and doo-dads. 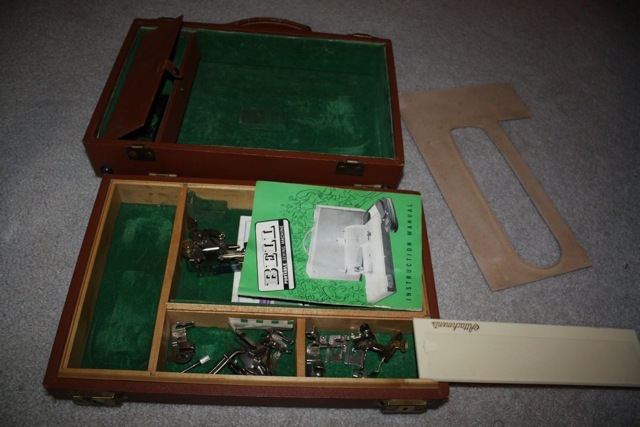 From what I understand it was sold as a Tailor's kit to travel with and a portable machine for those that needed a free arm(it actually clamps to a table) or a flat bed set up. It's very cute, very cool but would never take the place of one of my other machines. The bobbin is uber small and the bobbin case set up is fiditchy if there's a word:> It makes a nice little stitch, but has it's idiosyncrasies. I picked one of those up about a year ago. 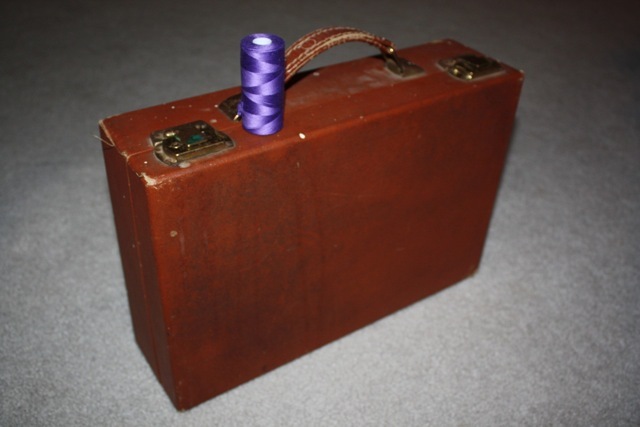 It’s cute and I think it’s neat how everything stows into a brief case, but I haven’t bonded with it enough to even try it out. 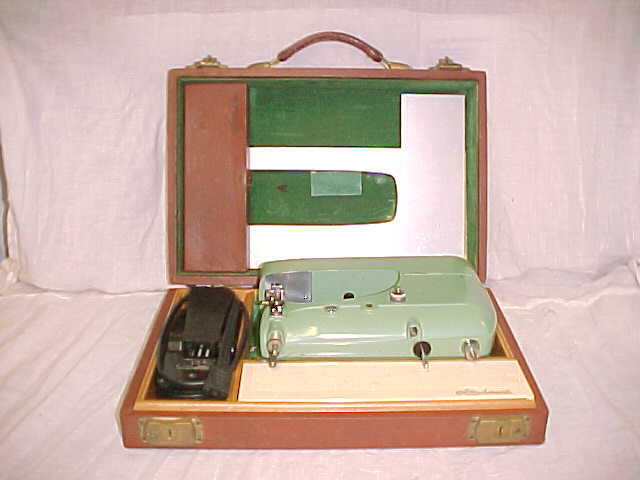 Mine is serial number 0008455, is complete, and the Inspection Tag is dated 1953. Mine doesn’t look any more well-used than yours does. 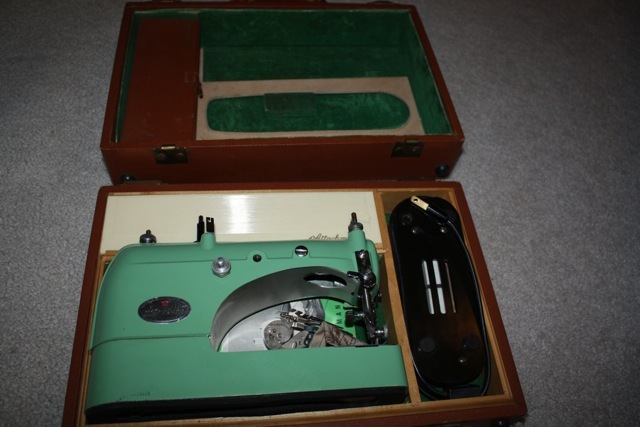 I wonder if these were actually that handy for their intended use, or were purchased in an effort to add a little glitz to a door-to-door sewing service and weren’t actually able to replace the Tailor’s regular machine? 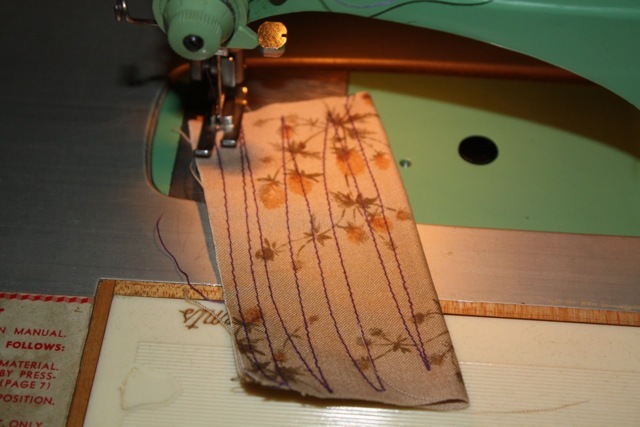 "I sew, I sew, so it's off to work I go!!!" That's a cute machine! Was it meant for young girls just starting to sew? 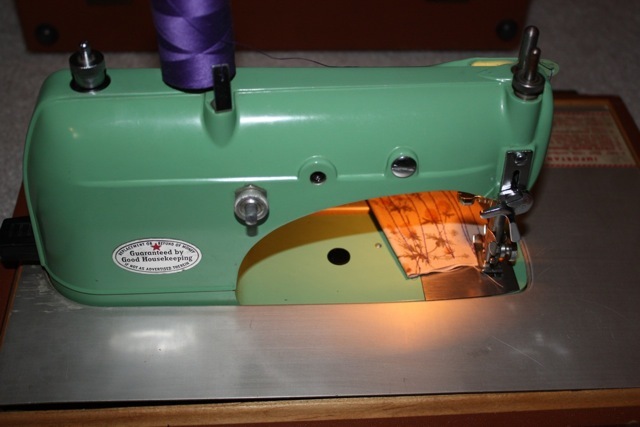 The next step from the toy sewing machine. 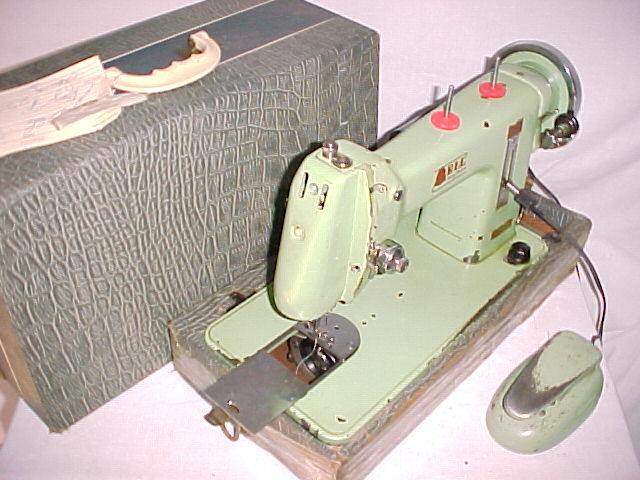 google "fischer mewa sewing machine"
Oh how cute !!!!!!!!!!!!!!!!!! id love one !!!!!!!!!!!!!! I host monthly 10.5 Layer cake swaps.. It's not a toy machine. It was "supposedly" meant for tailors but who knows for sure? I cleaned and oiled it and I found one nylon gear, the rest metal. Unfortunately, the later models like mine, have a plastic take up lever. Personally, I think the micro bobbins are a big turn off for real use. 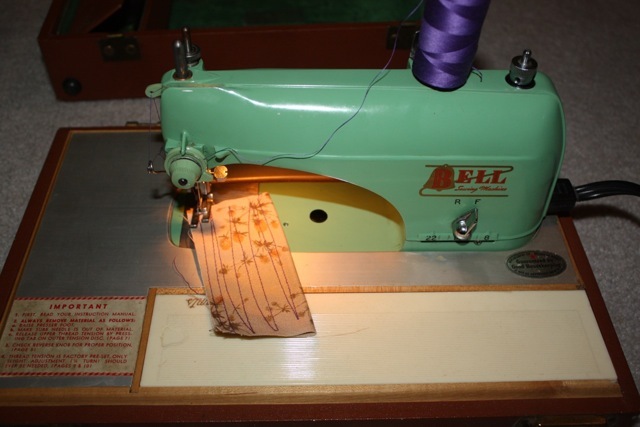 I could never piece on it because I'd be changing bobbins my whole life:> And the bobbin case needs to be removed every time and the thread system on it isn't the easiest to master. Even with my small hands! 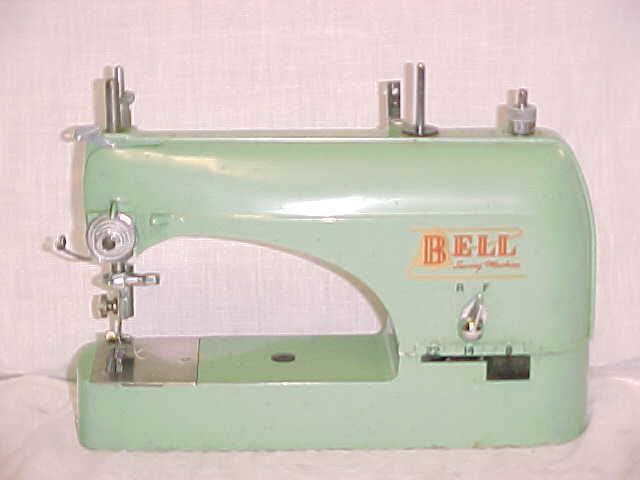 Bell made other machines, so they must have thought there was a market for the Model M (the ones shown above). I have a Bell 201 that appears to have had considerable use, so they must have made decent machines. I have a note in my database for the 201 that questions if it was made by Messerschmidt in Germany? Yup, someone local to me had one of those 201's for best offer. One of my first postings when I joined the forum, was of that machine and what should I pay...then someone let me know that we don't do prices here. LOL. I wonder if they stuck with the green color as a marketing tool or? I suspect the 201 would be an easier machine to use...though maybe not to lift! I have a nice German Fischer Mewa, complete except for cord and knee lever. The Mewa is about the same size as the Bell. she got a really nice collection of sewing machines. amazing. i wonder how long (and how much $$$) it took her to get all those machines. And did you see that quilt behind the counter that was the Periodic Table? Pretty cool! Loved seeing all the different machines. So many unusual ones: size, shape, color, etc. Who knew there were so many different ones made. Thanks for that link. I have been looking for one of these!! So cute! Thank you for sharing yours! Bell is one of the few still on my list to acquire. Though I've really not been looking very hard for one. It's so cute! I've never seen one before so thank you for showing me something new (to me). 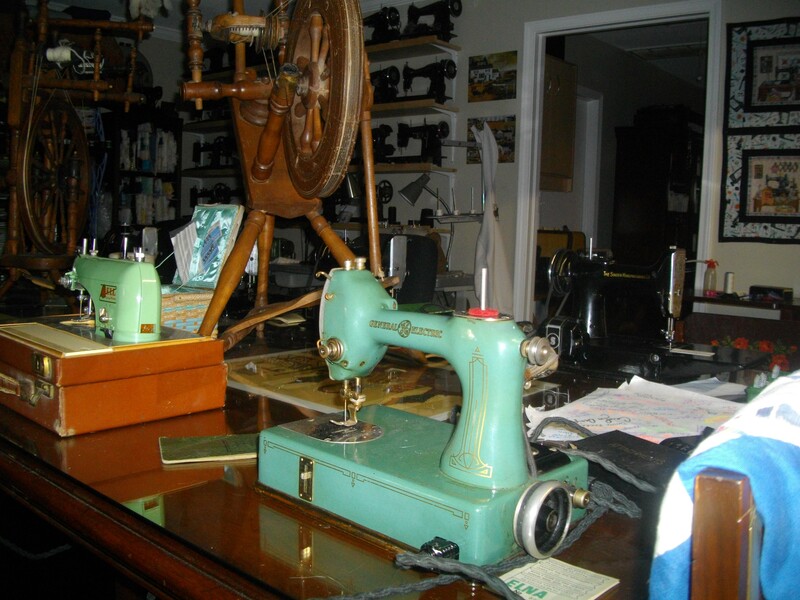 Leon, I love your sewing machine room! edit: Oops... just read that it's a sewing machine museum in Tulsa. Still extremely cool!!! that is tempting! but it looks like it's missing the insert that goes around the machine when you use the box as a table.